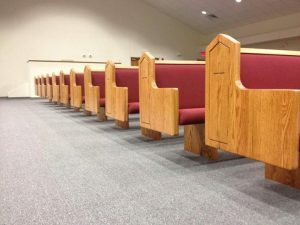 We recently installed some new church pews for Blunt Baptist Church in Sallisaw, Oklahoma, not too far away from our home in Twin Oaks, Oklahoma. We love serving the Oklahoma community. 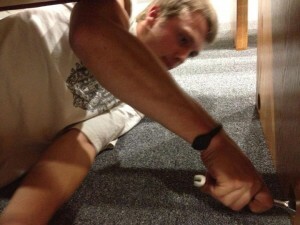 Our travels to install church pews take us all over the country and that’s a lot of fun, but there’s no place like home! Blunt Baptist had us install some beautiful modern style church pews with a lower church pew end. The height of the church pew ends are perfect for the tall cathedral ceiling of Blunt Baptist in Sallisaw because they help highlight the open and airy feel of the building. The shape of the church pew ends at the top echo the shape of the cathedral ceiling. As with most towns in Oklahoma, the town name of Sallisaw comes from another language. Meaning “salt provisions,” the name comes from the French word “salaison” because French trappers would salt bison they had hunted in the area before taking them to their final destination. Sallisaw was also home to two famous people on very different sides of history. Sequoyah, the inventor of the Cherokee alphabet and publisher of the Cherokee nation’s newspaper lived in a cabin near Sallisaw. You can still visit his cabin today. Sallisaw’s other claim to fame is as the home of Pretty Boy Floyd, a bank robber who was thought of by some as a Robin Hood of the west. After he was shot and killed in Ohio, his body was put on display in Sallisaw and his funeral remains the largest funeral ever in Oklahoma, attended by nearly 40,000 people. When we travel to churches to install new church pews, we take a crew. We’re a family business. Nick, here at the left, helped us install church pews in Blunt Baptist and just a few hours later, he married our beautiful daughter and became one of the family!